Frankie Manning, the dancer, innovator, and choreographer has been the unofficial Ambassador of Lindy Hop for much of his lifetime, for no one has contributed more to the dance than he. 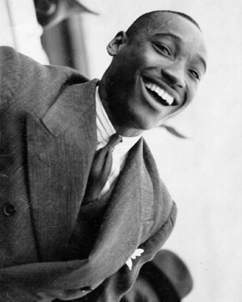 Originally touring as a dancer and choreographer with “Whitey’s Lindy Hoppers” in the 30’s and 40’s, he helped spread the popularity of the Lindy Hop through three continents. And with the Swing dance revival beginning in the 1980’s, Frank Manning, once again became a driving force worldwide with his teaching, choreography and performance. For all of these years, his deep love of Swing music and dancing has been as contagious as his dazzling smile. From its beginnings, Whitey’s Lindy Hoppers was much more than a dance troupe. It was a training ground that prepared the most talented social dancers of the Savoy Ballroom for professional gigs. It was also a social club that kept the young people out of trouble by allowing them unlimited access to the Ballroom – by day to practice and by night to dance to the best Swing bands in the world. Whitey’s group was formed from the crème de la crème of the Savoy – the top dancers in the top ballrooms of the Swing Era. With Whitey’s entrepreneurial skills, these Harlem youngsters were catapulted into world recognition thru both live performance and film. Their Swing dance innovations had permanent impact on the social dance styles of the United States, Europe, Australia, and even Latin America and parts of Africa. A father figure to many of these dancers, Whitey would send them downtown to those fancy digs with the admonition, “Remember, ain’t nobody better than you.” This advice must have come in handy in 1937, when a group of Whitey’s Lindy Hoppers stood in line to shake hands with the Queen of England! This self-respect and pride permeated the Savoy Ballroom, one of the few places on earth where Blacks and Whites could meet on the dance floor as equals.